You never know how much history can be "rediscovered" by walking one station-stop from Marymount to Caldecott. This I had to do at the start of the Circle Line Discovery since there was no train service to Caldecott; it was deliberate and planned, not that I refused to join the old folks in the queue for the shuttle bus service. While the two stations are quite near and connected by Marymount Road, I avoided using this road and instead skirted past Bishan Fire Station to Upper Thomson Road. Thomson Road is historical; it existed before 1850 and connects the town to suburban areas in the north. 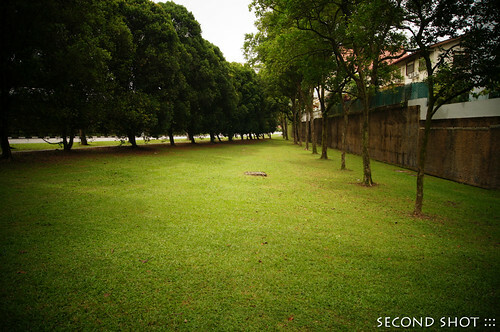 Halfway in-between the two stations, where Thomson Road meets Lornie and Braddell at the junction, is the start of Upper Thomson Road. Today the area outside Mount Alvernia Hospital is a very busy, some say messy, junction where one finds a flyover over another flyover built in a different period. 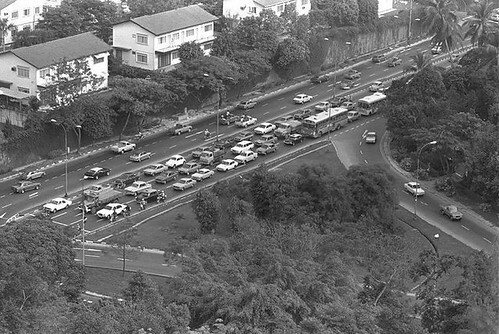 The more historical and lower flyover - Marymount Road - was opened in 1979 to alleviate the traffic jam along Upper Thomson Road near Braddell Road junction. Come to think of it, Marymount Road must be one of the solutions to reduce traffic congestion before the days of CTE; like an "expressway" it links Ang Mo Kio to Thomson Road before Toa Payoh Rise, and one could use Thomson Road to travel to town, much like the CTE today. Recently we heard of plans to build an "expressway" cutting through Bukit Brown cemetery that would reduce congestion on Lornie Road, a variation of the same theme. Upper Thomson Road near junction with Braddell Road (Straits Times, 1977). Note the retaining wall and detached houses on the Westlake Gardens side. 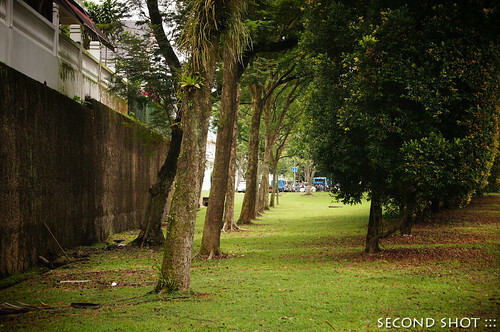 The same retaining wall and detached houses at Westlake Gardens; and a nice lawn where Upper Thomson Road used to be (Oct 2011). If you chance upon an old map or street directory of this very busy junction, like this 1963 edition, look closely at the angle of Upper Thomson and Lornie Road which is at a less obtuse angle than today. The old realignment of Upper Thomson was actually closer to Westlake Gardens and parallel to the row of detached houses, according to the above 1977 photo. As a result of realignment, which would have happened some time after 1979, the start of Upper Thomson swung away from Westlake side and today it is a triple carriageway with a flyover up Lornie Road, and the original Upper Thomson was preserved much like another old road in my previous post - a green coridor! 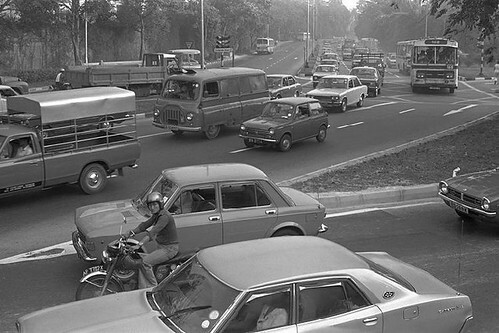 Upper Thomson Road near junction with Braddell Road (Straits Times, 1977). The retaining walls are on the left. The road actually bends to be parallel to the wall. What's historical today are the retaining wall that once had the double-carriageway of Upper Thomson running parallel to it and the row of detached houses above the wall. The houses might even have existed in the 1960s with their antiquated design (you can examine them in Google street view), though I think they look nicer than the more modern houses further down Westlake Ave, what do you think? 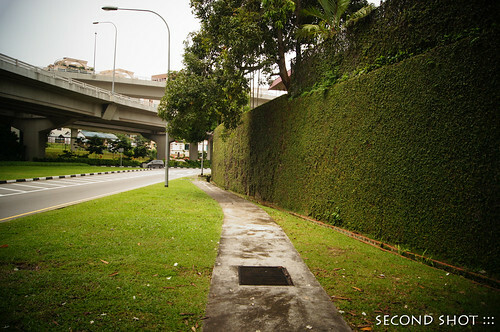 The retaining wall where Upper Thomson Road used to run parallel. Do you think the row of trees are the original roadside trees of Upper Thomson? How the start of Upper Thomson swung away from the retaining wall. I would surely be lost trying to find my way these days. In 1983-84 I lived at Gardenia Court, Jalan Mata Ayer. I would daily travel this intersection on my way to Sembawang Rd. At the time, Yishun was only under construction, and there were still a couple of tiny kampung areas even further north along Sembawang. There was one place in particular friends and I would go for food and provisions, but there's no way for me to remember the name of the area. It could have been on Nelson Road, but I'd have to dig out my old street guide and see if the memory could be jogged. There's a bit of architectural history behind those granite walls@Wstlake bunaglows. In the 1960s when this estate was built, granite was used for the very first time on a large scale by the developer to make the retaining wall. Previously only individual bungalow owners could afford it. Someone should tell SMRT management about the confusion over Botanical Garden Station. I asked one of the staff on board the train which was nearer to Bukit Timah Road - Farrer or Botanical Gardens. The staff (not just one) told me Botanical Garden was located@Napier Road. You come out you see a hospital and foreing embassies. Thanks Peter for telling us the architectural history of those westlake bungalows. Err, I think you mean 600k, not 60k? Looks like the mistaken staff did not attend their own Circle Line Discovery. Can't blame them, most people including me only can imagine Tanglin Gate of Botanical Gardens. Perhaps they should have named the station "University of Singapore" or "Raffles College". Bunaglows were $60K in Westlake. Over at Caldecott facing the cemetery, bungalows were going for $50K would u believe in the mid-60s. $100K+ buy you bunaglows in Queen Astrid Park. By 1980 Nassim Mansion with 3.6k sg ft (behind former Tanglin Police Station) was $250K. All through my school days; P1 to JC, I passed by this place practically everyday. In primary school (Braddell Rise School - early 60's), I don't think the houses facing Mt Alvenia were built yet. I remember our teacher brought us to MacRitchie for excusion. We had to 'line up' in 2's and hold hands to cross the road. Later the roundabout was replaced by a Y-junction with traffic lights. Yet later they built the Lornie flyover linking Upp Thomson to Lornie Rd and then recently the viaduct. I thought surely they would demolish the BRS buildings; but thankfully I was wrong.